Royal Green Organic Iron Complex is made from a powerful combination of Amla (vitamin C), Stinging nettle, Aloe vera, Turmeric, Ginger and Black pepper. It contains a certified organic Vitamin C and superfoods that improve the absorption of iron into the body. Iron contributes to the normal formation of red blood cells and hemoglobin. Together with a powerful combination of Amla (vitamin C), Stinging nettle, Aloe vera, Turmeric, Ginger and Black pepper, their certified organic superfoods improves the absorption of iron. This is why they can guarantee an optimally working product with Iron contributing to the reduction of tiredness. Curry leaf extract (Murraya koenigii), Capsule: HPMC, Stinging nettle (Urtica dioica), Amla extract (Emblica officinalis), True aloe (Aloe vera), Anti-caking agents: Talc and Silicon Dioxide, Turmeric (Curcuma longa), Ginger (Zingiber officinale), Black pepper (Piper nigrum). Food supplements should not be a replacement for a varied and balanced diet, and a healthy life style. Below are reviews of Royal Green Organic Iron Complex - 60 Vegicaps by bodykind customers. If you have tried this product we'd love to hear what you think so please leave a review. 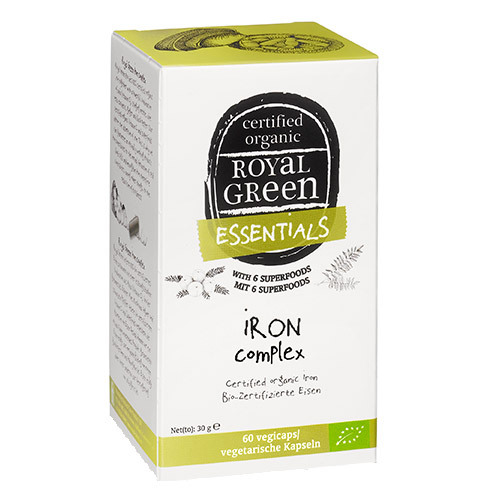 Royal Green Organic Iron Complex is made from a powerful combination of Amla (vitamin C), Stinging nettle, Aloe vera, Turmeric, Ginger and Black pepper.